That’s right, it’s time for another guest week. Because sometimes I get tired! Anyway, I really like these guys’ artwork. Juan Navarro makes Dave look appropriately rumpled. 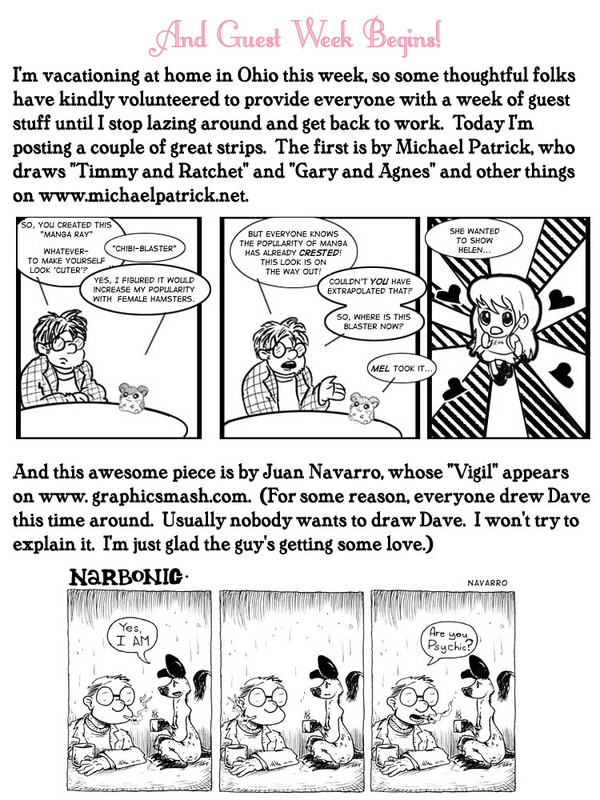 I was actually really happy that so many people drew Dave for this round of guest strips. Dave’s entire character design–the hair, the facial hair, the glasses–is pretty far from actual human features, so it’s interesting to see how different artists draw him. As long as we’re sharing guest art, check this out. Meir Hoberman created “versions of all the major characters in Narbonic and Skin Horse drawn in 8x magnification and featuring a variety of historical periods with interesting costume.” Helen, Dave and Mell are at top, with most of the central humanoid Skin Horse cast below. Now that’s dedication. Thanks, Meir! Who would have thought that rabbinical students had this much spare time on their hands? Thanks, Meir, this is amazing! Speaking of guest art, look at today’s Dog Eat Doug (http://www.gocomics.com/dogeatdoug/2010/11/28/). The heart-meltingly adorable winged Sophie is a dead ringer for the equally adorable gerbilfly from the very last Narbonic strip: http://www.webcomicsnation.com/shaenongarrity/narbonic/series.php?view=archive&chapter=15096&name=narbonic&mpe=1&fromwhich=10000&direction=b. So from top to bottom, as far as I can tell, it’s Helen, Dave, and Mell, then Tip, Unity, Dr. Lee, Marcie (not sure, but looks like red hair), Tigerlily Jones, then maybe Chris at the bottom? They give me eye strain! Ed: No, the bottom one’s not Chris. It’s wearing a succession of uniforms, see? They don’t change much over time, compared to fashion. Maybe Konstantin? It’s Konstantin, yeah. I carried the blue-black-and-white color scheme from his uniform throughout history, mostly. It seemed appropriate. I didn’t even think of doing Chris–most of my research consists of googling interesting combinations of keywords, and I wouldn’t know where to start on figuring out which fashion trends were “nerdy” in 1650. I had enough trouble getting accurate images for any CHinese dynasty but Song and Ming, for Dr. Lee (she’s Chinese, right? If not, how embarrassing)! And at this point I’m an unemployed former rabbinical student, hence the ridiculous amounts of time on my hands. I think Dr.Lee is Korean. Oh, and I’m supremely honored to have inspired an Ed filk! Hooray! She doesn’t change clothes much. All I could think of would be to research when certain breeds of dog were created, eventually shading her off into a wolf. But however mixed my historical fashion knowledge, I know absolutely zip about dog breeds. So…no Sweetheart. Also I just realized I forgot the last row of Skin Horse characters. Darn. 1770, 1850, and 1830 were probably the most fun. The Tang and Ming Dynasties were fun too.